Alice falls at the gym and hits her head. When she comes to, she realizes that she has lost memory from the last 10 years. She doesn’t remember her own children. She finds out she is estranged from her husband, her sister isn’t speaking to her, and why was she even at the gym?…she hates the gym! She discovers all kinds of strange things about herself and sure has some catching up to do – a lot of things can happen in 10 years! Essentially she must depend on the people around her to tell her who she is now. And she’s not so happy with what she finds out! Moriarty’s opening allows her character to time travel back to a happier time and examine what may have led to the demise of her marriage. The amnesia trick is not a new one, and at first it seemed a bit contrived to me. However, Moriarty’s writing saves the set-up and the predictable ending. She does know how to build a compelling story and I did get hooked, despite my early misgivings. 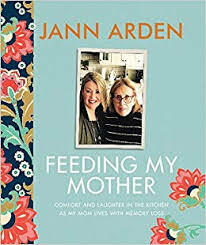 The novel doesn’t have as many exciting twists and turns as The Husband’s Secret and is not quite as much of a page turner, but I would say it’s a “summer beach read plus”, enhanced with some wisdom and substance. It has some really good things to say about marriage and how to make relationships work. It’s good for the reader to consider how to remember what Alice forgot. 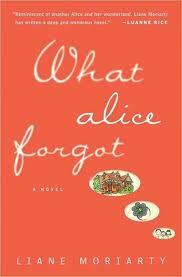 This entry was posted in Fiction and tagged amnesia, Liane Moriarty, What Alice Forgot. Bookmark the permalink.